SANTA MONICA, CA - 11/28/2016 – At 86 years of age, Eva Haller has created a legacy that will last for generations. As a teacher and mentor, she has inspired and guided many young people to a life of social activism. This month, The MY HERO Project honored Haller with the inaugural Women Transforming Media Award. 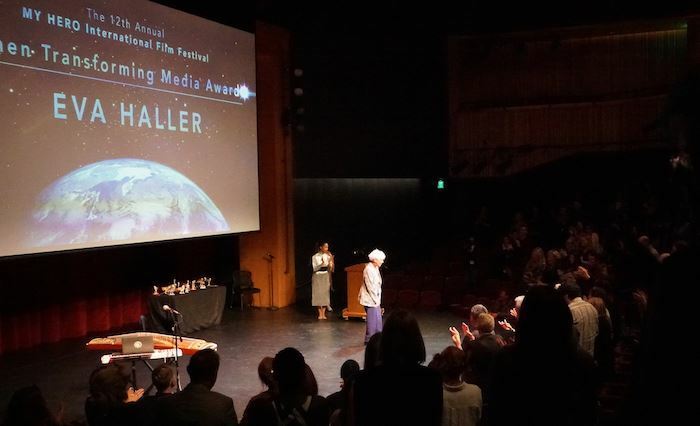 Haller accepted the award at The MY HERO International Film Festival Awards Ceremony, Saturday, November 19th, in Santa Monica. Women Transforming Media (WTM) is a joint effort between The MY HERO Project and the American Association of University Women, designed to examine how issues-oriented organizations are addressing gender inequality in the social, political and economic arenas. WTM points out the connections between the entertainment industry and the non-profit sector by sharing the stories and work of women like Haller, who are transforming the media landscape and the world. 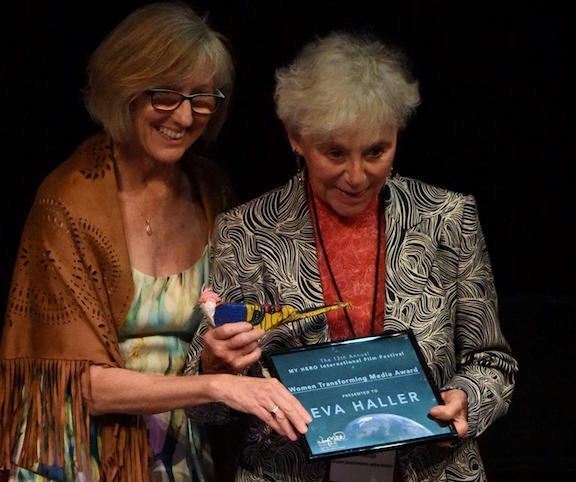 Festival Director Wendy Milette presents the Women Transforming Media Award to Eva HallerHaller was born in Budapest, Hungary, before the Second World War. She grew up in a culture of art, music and love of country. When Nazis invaded the city, Haller hid in a Scottish Girls Boarding School, where headmistress Jane Haining was sheltering several Jewish children. Haining, captured by the Nazis, was the only Scottish woman to be murdered in Auschwitz. Eva escaped the concentration camp by convincing a young Nazi soldier that she was much too young and beautiful to die. She escaped, taking with her a young boy who was in her care. When Nazis killed her beloved older brother, Haller vowed to honor him by living her life with a sense of purpose. Since then Haller has navigated the globe, using her talent as a communicator and her skill as a media maker to nurture and support leaders of non-profit organizations that serve women and children around the world. Haller came to the aid of 13-year-old Craig Kielberger, who had a vision of ending child labor in the world. The result was Free the Children. As chair, Haller helped Kielberger create a worldwide organization that engages young people to help educate and support children in need. Eva Haller addresses the audience at The MY HERO International Film Festival Awards CeremonyShe mentored Kathy Eldon, of Creative Visions Foundation, and Jessica Mayberry, of Video Volunteers, in their efforts to help young people change the world through media. Jane Goodall, world-renowned environmentalist and primatologist, counts Haller among those who helped her build her organization and engage young people to care for the planet. In 2014, Glasgow Caledonian University (GCU) honored Haller with a doctorate degree for her leadership and hard work with the university to create sustainable and fair trade in the fashion industry worldwide. The list of people and organizations mentored by Haller is long: Sing for Hope, Women for Women International, The Rubin Museum of Art, A Blade of Grass Foundation, The Sunny Center for Wrongfully Accused, The UCSB Foundation, The Whitney Museum of Art, The Manhattan Girls Choir, Asia Initiatives, The News Literacy Project and more. Through Women Transforming Media, MY HERO is producing the documentary series Eva Haller: A Work in Progress to share her remarkable story with the world. A segment of the series was screened at the Awards Ceremony. Eva Haller: A Work in Progress and winning films, from The MY HERO International Film Festival, can be viewed at myhero.com/winners. The festival is part of The MY HERO Project, a 501(c)3 organization dedicated to sharing stories of heroes from all parts of the world. MY HERO's award-winning website (www.myhero.com) hosts the world's largest archive of hero themed stories, music, art and short films.